Pokemon Yellow was the only fourth version title in Japan and first in a line of third version games in other territories. Released in 1999, it offered updated graphics and a redesigned Unknown Dungeon, as well as new rosters for trainers throughout the game, including most significantly the Gym Leaders. Far more noticably, however, was the idea behind the game - it is almost entirely based off the original Pokemon cartoon, right down to a following Pikachu. 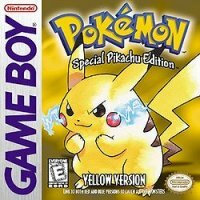 A few Pokemon became available in Yellow who before were limited to only one game, whether they were exclusive to the Red or Blue versions or Pokemon the player had to choose between. The original starter trio was able to fight on the same together with just one game, and Pokemon like Scyther and Pinsir could be caught in the same area. Despite this however, some Pokemon were absent, usually ones Ash would miss out on catching in the show, such as Weedle and Meowth. This game, like Red and Blue, is set in the Kanto region, albeit a much stripped down one from what modern players will be used to. Veteran fans may recall there being no such thing as the day/night or seasonal cycles, breeding, online trading, contests, or any other features introduced later in the series. Yellow seemed to focus purely on catching, battling, and trading Pokemon, as well as treating Pikachu like a companion on your travels much more intimately than any other Pokemon. Many of the game-breaking glitches in the first two games were fixed with Yellow's release. This game section will focus purely on what the creators intended players to find.